The first time I met the broader Ffumbe clan, they named me Kigozi and welcomed me with some of the warmest hospitality I have ever experienced. 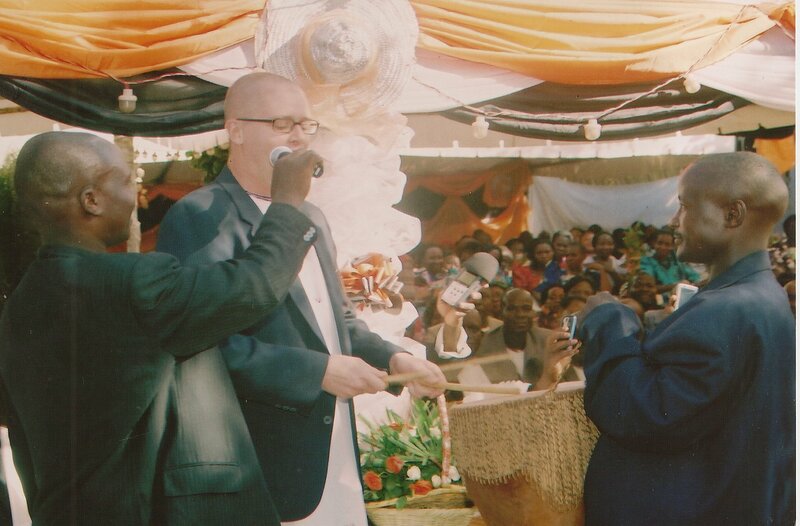 Subsequently, I lived with Magoba and his family in Ntinda. During this time and since then, whenever I’m in the country it’s a matter of joyful social obligation to attend family and clan-related events. Parents here use the same terms for their nieces and nephew that they use for their daughters and sons, so there’s no such thing as extended family in the sense that we think of it. People are just brothers and sisters, sons, and daughters. That means every time one of those people introduces her soon-to-be spouse to her parents, gets married, graduates from something, has a child, or dies, I have the privilege of joining the Ffumbe clan for commemorative events and life-cycle rituals. This past weekend, it was okwanjula, literally meaning “to introduce.” One of our sisters, Zawedde, was introducing her fiancee to her parents. This is a normal ritual for youth preparing for marriage here. The biologically related clanmates and friends of the bride gather at her parents’ home, where they await the arrival of the groom and his family. When they come, they begin an extensive set of complex greeting customs that eventually involve the exchange of dowry and the agreement between families that their children will marry. 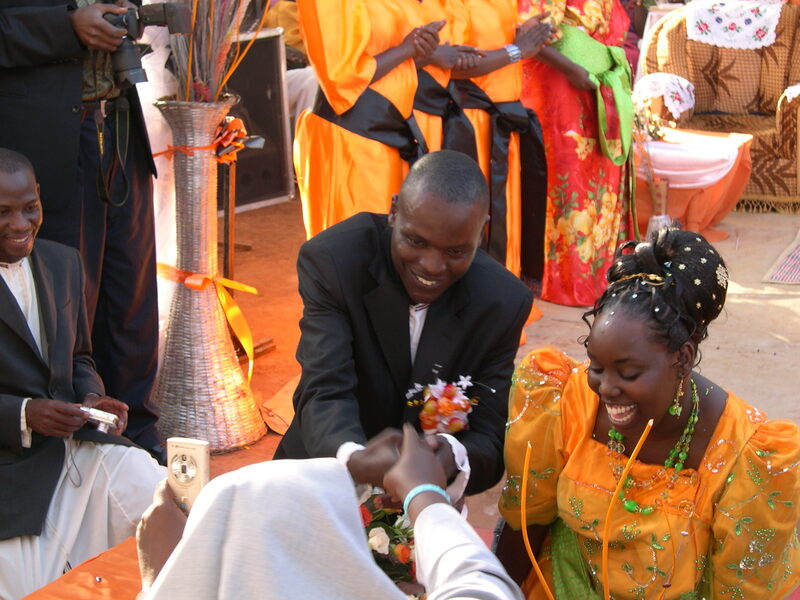 Above: the happy couple greeting ssenga, an auntie of influence in the family. At an earlier kwanjula, I had been asked on the spot to beat the mubala, a kind of slogan that every clan has. These are normally proverbial or riddle-like in nature, and they often identify the totem animal of the clan and/or outline taboos pertinent to that clan. Evidently I performed well, because Magoba asked me to come to Zawedde’s kwanjula to beat an extended version of the mubala for Ffumbe clan. Which animal? The civet cat! The one who dips his food in every kind of sauce: you shall not dip into that of the civet cat! The last two lines of this mubala identify the ffumbe, or civet cat, as the muziro (totem animal) for this clan. The last line makes explicit the food taboo associated with this animal. Even one who eats all kinds of animals should not eat the bush meat or even taste the sauce of the ffumbe. There’s another connotation here, too: the food taboo parallels a sexual and marriage taboo whereby one member of a clan must not marry a member of the same clan. Well, the whole thing was an even bigger success than the previous time. It’s all because of Magoba’s careful mentorship. It was he who taught me a deeper version of this mubala, he who invited me to perform it again. His habit has always been to thrust me into public situations to test my skills and encourage me to rise to those occasions. Wattu musajja mulungi ow’effumbe, kitange kiganda: weebale kunsomesa ssebo! My dear good man of the Ffumbe clan, my Ganda father: thank you for teaching me! *Edward Waalabyeki Magoba is a novelist, folklorist, magazine publisher and radio personality whose vernacular writing has had a huge impact on southern Uganda. His radio program, Ekyoto, offered 90 minutes of folklore-fueled fun for all ages on Saturday nights before CBS radio was shut down here late last year. But wait! Where’s your hair? Did you have to cut it super short on account of the performance? Or just an aesthetic decision? No, I just cut it for the same reason as always: keeps the dust in my hair to a minimum. That was particularly useful on this day, as the kwanjula was down a road so dusty that the hosts poured water on the road to keep the dust from passing traffic down! Mwami Lubega, weebale kusoma. Mr. Magoba is a walking library and a dear friend. There is nothing that gives one pride as knowing that people from a by far different culture treasure and find meaning in his own culture. Kiganda culture and norms with our rich language is a real treasure. Webale nyo mukwano kwagala bwabuwangwa byaffe. I miss you mom. Buganda. Wattu Simeo, weebale kusiima mukwano. Kaakati, kansuubire nti ogenda mu maaso n’osoma ebiwandiiko ebirala byange wano n’ombuulira by’olowoozizza. Nze njagala nnyo okuddayo e Uganda, kubanga abantu abo balungi nnyo. Weebale kusoma. Ssabasajja Kabaka awangaale! Mwami kigozi Peter webaale kwagala kika kyaffe nokukiyiga akawoonvu na kagga.Twesiimye okukugatta ku bazzukkulu ba Walusimbi. Mukama abere naawe. Congratulations to Ffumbe clan for winning the Bika competition of Buganda Tourism Expo 2015.